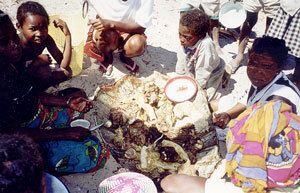 It is said that you can find vezo people from Androka in the south almost until Mahajanga in north, but their epicentre remains the coast between Toliara and Morombe. They are there in contact with the Masikoro and the Mikea people, which live in the close dry forests of hunting, gathering and honey collection. Some ethnologists like to do the parallel between Mikea, seminomads of the forest, and Vezo, seminomads of the sea. South of the Onilahy river, they're called ' Sara '. For the visitor, the most visible material mark of the vezo identity remains the dugout, similar to null other on the large island, and always similar to itself since centuries. Its manufacture as its operation require a true know-how, transmitted from generation to generation, as its proportions which maintains it elegant and breedy on water, even with a sail perforated or coarsely patched with rice bags -- then only slower --, straightforwardly splendid when the owner is rich enough to decorate it with sharp colors. It is used for the fishing and the carriage of the people and the goods, in the coastal lagoon that constitutes a long protected channel but also outside, to pass the estuaries or to reach the distant places of fishing. In an ordinary vezo village, the daily activity is thus turned towards the sea: fishing according to the season and the tide, with the net, the hook, the tow-net and especially on the platier of the reef, fish or octopus fish; collecting holothuries, sea urchins, shells (tsakodia for example for consumption, but many others for the account of purchasers and foreign collectors, even those protected by the convention of Washington); growing algae (in Tsifota, Beheloka...); trading fishery products; transporting by dugout the products of the sea and various goods (sweet potatoes, reeds ' vondro ', etc); building and maintening the dugouts... A certain number of ceremonies rythmn social life : soritse and fandeha (marriage), funeral, bilo (ritual of cure), savatsy (circumcision, that certain Vezo clans do not practise)... One worships like elsewhere in Madagascar the ancestors which, more or less divinized, can be called in sometimes spectacular transe rituals : ' trombas '. And on the evening one listens, on an approximate sound system which adds to its rough charm, a little tsapiky, watching somonjara dancing kininike, and drinking rum in some local epibar. Even if some people consider that the total impact of the Vezo on the reefs remains negligible, one can question oneself, by noticing the degradation of certain close reefs (the large Toliara reef , and where are the turtles that made the fame of Nosy Ve?) on the future of Vezo as "people of the coast". They are more and more numerous and facing an intensifying world pressure on fish. Won't they have tendency, as all the fishermen in the world, to exhaust the resource which foods them and, for Vezo, defines them? We already can answer by the affirmative. The whole coast is today looted. 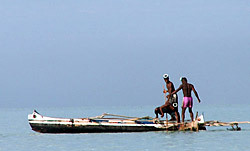 Without a proper regulation, one can be only pessimistic about the future of coastal resources, and for the wealth of the Madagascar lagoons.